Ghost Roads IV: Abandoned highways in Md., Va.
For a fourth year in a row, WTOP unearths six more rundown, abandoned highways in Maryland and Virginia. Ramble down these crumbling ghost roads if you dare; most are covered in underbrush and one is even submerged underwater. WASHINGTON ― Nothing is forever, not even highways. As a road network evolves, some of its appendages become defunct and are sloughed into the woods, never to be a traversed again. Over time, most of these bygone byways are erased by suburban sprawl or forces of nature, but vestiges of these ghost roads can live on in the underbrush. Many thoroughfares in Maryland and Virginia began as deer trails or old Native American paths. As these foot trails morphed into colonial dirt roads and paved motorways, their alignments were straightened and their grades were smoothed to accommodate heavier vehicles with more horsepower. Look carefully, and you might just spot the old, windy alignment of U.S. Route 1 in Stafford County. A twisty section of Route 1, originally called Va. Route 31, was straightened through Stafford County during the late 1930s. Fractured segments of the old highway would later become residential streets such as Jumping Branch Road and State Shop Road. The ghost of a windy U.S. Route 1 in Stafford County. Hidden in the woods not too far from the Rappahannock Regional Jail, an old two-lane bridge above Accokeek Creek marks the spot where Route 1 used to be. Thick vines have latched onto its walls and mature trees grow from its abutments. The through-girder concrete bridge was built in 1920 at a cost of $8,811.52, according to the Virginia Department of Transportation. The highway department’s archives suggest the derelict structure was abandoned before World War II. Remarkably, it has remained upright and out-of-sight for more than 80 years. A chunk of Gum Spring Road in South Riding is in an earlier state of decay while facing a similar fate. The new Stone Springs Hospital Center access road absorbed part of Gum Spring Road during construction. The section of the road between the hospital and Arcola was renamed Stone Springs Boulevard. Loudoun County formally abandoned the leftover stretch of Gum Spring Road near Route 50 by board resolution in February. A severed segment of the road remains behind a stand of trees east of Medical Drive. While the northern extremity of Gum Spring Road disappeared without much fanfare, the future of another ghost road near Warrenton is the spotlight. The timber-planked Waterloo Bridge along Jeffersonton Road, built during the Rutherford B. Hayes administration, was closed to traffic a few years ago after an inspection revealed severe deterioration of its cast iron supports. The 139-year-old iron truss bridge is nestled in the heavily-wooded Rappahannock River Valley on the Fauquier-Culpeper County line. Its stone piers are a popular launching point for canoers and kayakers during the summer. It was also known for being a haven for wayward delinquents and a magnet for late-night reckless drivers until it was closed during the winter of 2014. Some nearby residents want to see the single-lane Waterloo Bridge rehabilitated for vehicular traffic, while others prefer that it serve only pedestrians and recreational users after restoration. At a public meeting early in 2017 hosted by VDOT, community members, local officials and other stakeholders weighed in on what should be done with the aging structure: 63 percent favored restoring the bridge for vehicular traffic while 35 percent either opposed the project or wanted a restoration aimed at preserving the bridge for pedestrians and bicyclists. The structure is eligible to be listed on the National Register of Historic Places. A complete overhaul of the bridge would require a painstaking dismantling of its truss and a re-installation of the structural components, requiring the removal of nearby trees and vegetation. 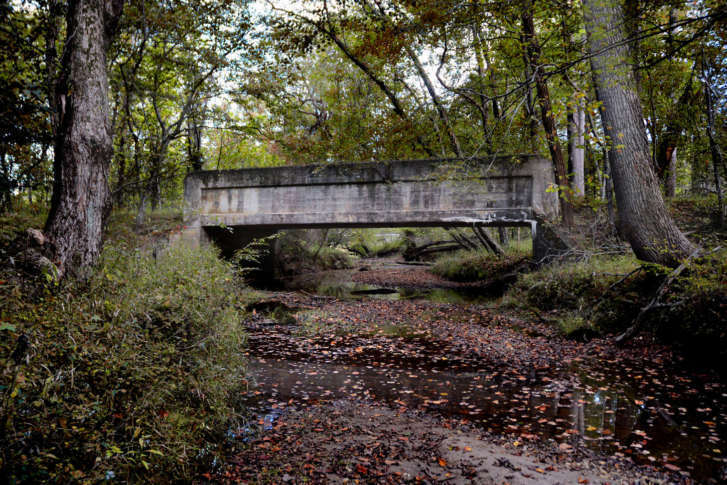 There are many examples of ghost road river crossings throughout the region, including Governor’s Bridge Road and Queen Anne’s Bridge Road at the Patuxent River in Maryland and the Goose Creek Bridge in Upperville, Virginia. These landmarks stand silently in the forest, having survived decades of flooding and neglect. Many of the region’s ghost roads are swamped by undergrowth, but at least one is submerged underwater. On the outskirts of Eldersburg, Maryland, is a mile-long section of Old Liberty Road that disappears under 100 feet of murky water. When the North Branch Patapsco River was dammed in the early 1950s, the reservoir that formed overtook a section of the main highway, better known as Oakland Mills Road, between Libertytown and Baltimore. The rising water also submerged a significant portion of Oakland Mills, a small mill town. Old Liberty Road can still be seen outside of Eldersburg, but most of it is out of sight...and underwater. The stubs of the old road can still be seen on both ends of Liberty Lake near where a new highway bridge was constructed after the river valley was flooded. Not too far from the ghost of Oakland Mills Road, the abandoned Sykesville Bypass towers above the South Branch Patapsco River. On the north end of the two-lane bridge, the year 1962 is etched in a concrete wall. The bridge was opened to traffic in October 1963 and remained in service for four decades. The bridge’s supports were not made of steel like most bridges; its three girder spans consist of triangular aluminum box beams that cradle a concrete slab deck. It’s a rare breed; it is one of only six aluminum bridges in the United States and the only one constructed in Maryland. Comparable to the strength of steel, aluminum has excellent corrosion resistance. It is considered a historic Maryland bridge and is eligible for listing in the National Register of Historic Places. Despite its robust supports, the bridge was deemed structurally unfit for traffic in 2004 after an inspection revealed deterioration of the concrete bridge piers and smaller steel components. The Sykesville Bypass Bridge can easily be seen from its replacement — a new section of Route 32 parallels the old ghost road, crossing the river valley and a set of railroad tracks on a new highway bridge. Aging yet still erect, the bridges that punctuate these ghost roads stand as monuments to the skilled laborers and engineers of generations past. The retired roads that lead up to their abutments are important reminders of how we got to where we are today ― on the roads of decades past.